Hello Readers! 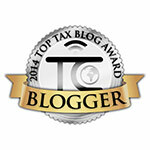 A two month hiatus from tax-blogging is a long time to be away. Especially at this time with so many changes- exciting or scary- happening in the tax-world! My first born heading to college was definitely more challenging than I expected and yes, that's my excuse and I am sure you would agree that it's a good one? Well, as if sending off my son to college wasn't exciting enough, I filed for non-profit status for a client using the new Form 1023-EZ. This process used to be a long, arduous and complicated one. Most organizations contemplating going down that route had to wait months after filing for determination of non-profit status to hear back from the Internal Revenue Service, often not being able to raise as much capital as they expected. So What Is Non-Profit Filing Status? : A non-profit organization is a group organized under state law for purposes other than generating profit and in which no part of the organization's income is distributed to its members, directors, or officers. Each state in the US defines non-profits differently. Most federal tax-exempt organizations maybe nonprofit organizations, organizing as such at the state level does not automatically grant the organization exemption from federal income tax. To qualify as exempt from federal income tax, an organization must meet requirements set forth in the Internal Revenue Code. 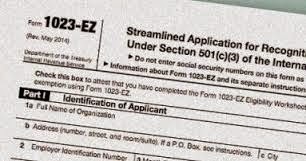 The New Form 1023-EZ: Available on IRS.gov as of July 1st, 2014, the new form is three pages long, compared with the standard 26-page Form 1023. Most small organizations, including as many as 70 percent of all applicants, qualify to use the new streamlined form. Most organizations with gross receipts of $50,000 or less and assets of $250,000 or less are eligible. This form MUST be filed online at www.pay.gov, the $400 user fee is payable at the time of submission. The instructions contain a checklist to determine if your organization is eligible to use this method of filing for non-profit status. My client's filing was approved in 3 weeks! The Internal Revenue Service's logic for introducing the new streamlined application according to Koskinen is, "We believe that many small organizations will be able to complete this form without creating major compliance risks. Rather than using large amounts of IRS resources up front reviewing complex applications during a lengthy process, we believe the streamlined form will allow us to devote more compliance activity on the back end to ensure groups are actually doing the charitable work they apply to do." However not everyone is as excited about the new form. Diana Kern, the Vice President of Programs at NEW writes in her blog, " Let the small nonprofit rain storm begin. Donors beware. Perhaps not all of these small nonprofits will be scammers, but there is no guarantee they have the requisite capability to run a business and use your donation responsibly and effectively. My recommendation… perform due diligence before you donate to any nonprofits in the future." However simplified or not, if you are in the process of setting up a non-profit or thinking of doing so, I would still suggest consulting an Enrolled agent or other tax professional.